-Explore and reflect on the lived experience of anticipatory grief. -Learn the basic tenants of mindful photography (MP) and its connection to aesthetic awareness. 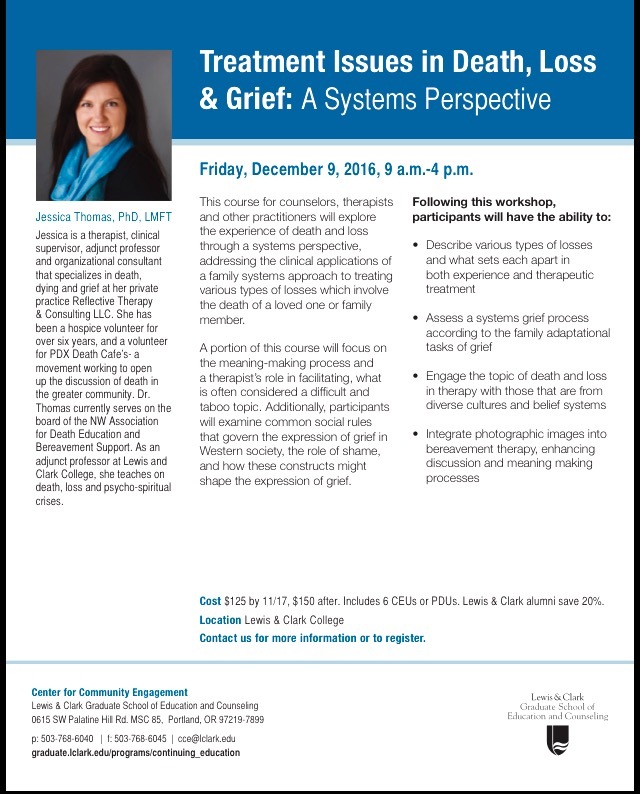 -Understand the practice as a therapeutic method in preparing for the death of a loved one. Oregon Hospice & Palliative Care Association’s annual Fall conference in beautiful central Oregon at Eagle Crest Resort, September 24th-25th, 2019. 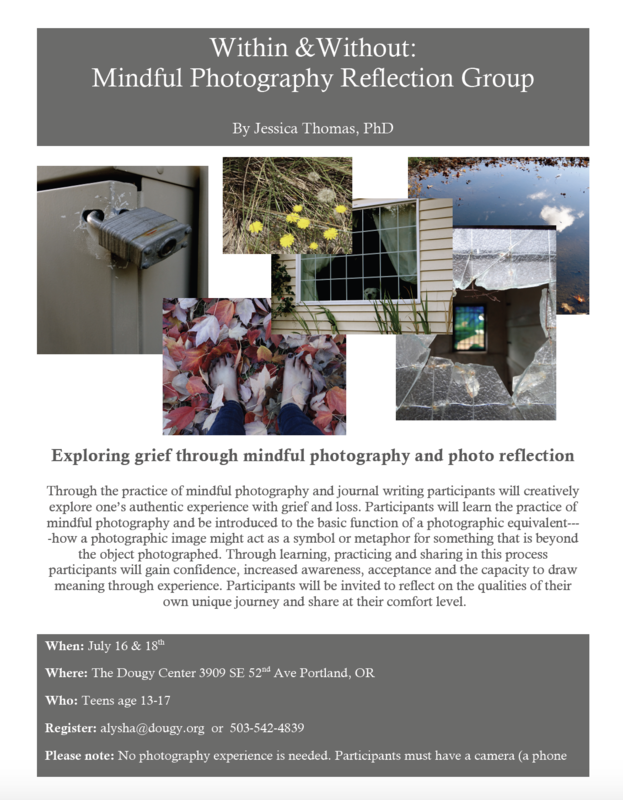 NWADEBS President, Jessica Thomas PhD, LMFT will be presenting on her research regarding the practice of mindful photography, end-of-life caregiving and anticipatory loss. Through the practice of mindful photography and journal writing participants will creatively explore one’s authentic experience with grief and loss. Participants will learn the practice of mindful photography and be introduced to the basic function of a photographic equivalent—-how a photographic image might act as a symbol or metaphor for something that is beyond the object photographed. Through learning, practicing and sharing in this process participants will gain confidence, increased awareness, acceptance and the capacity to draw meaning through experience. 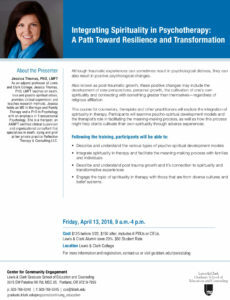 Participants will be invited to reflect on the qualities of their own unique journey and share at their comfort level. Please note: No photography experience is needed. Participants must have a camera (a phone camera will work) and able to download and email images. ancient traditions speak about transforming suffering into a resource for internal strength and growth. Although traumatic experiences can sometimes result in psychological distress, they can also result in positive psychological changes. Also known as post-traumatic growth, these positive changes may include the development of new perspectives, personal growth, the cultivation of one’s own spirituality and connecting with something greater than themselves—regardless of religious affiliation. This course for counselors, therapists and other practitioners will explore the integration of spirituality in therapy. 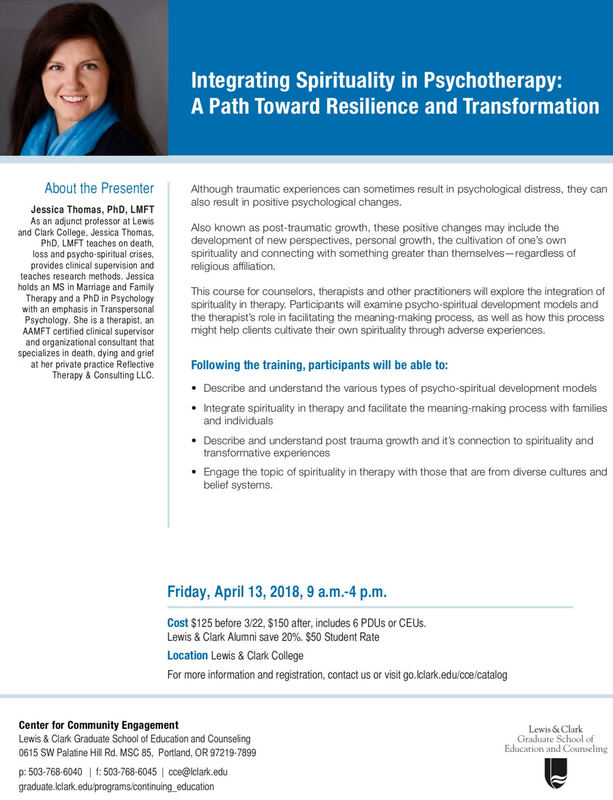 Participants will examine psycho-spiritual development models and the therapist’s role in facilitating the meaning-making process, as well as how this process might help clients cultivate their own spirituality through adverse experiences. Furthermore, a portion of this workshop will discuss and consider the clinicians spirituality and the self-of-the-therapist. Dr. Jessica Thomas brings a new 4-week series to the Lake Oswego ACC. As in yoga and meditation, this is mindfulness with expanded awareness as applied to photography. Through this introductory class you will practice engaging in the world with increased awareness and presence. Participants will learn and practice mindful photography and be invited to share within their own comfort level. Through imagery and shared discussion, you will be able to express your experience creatively in a safe and accessible space. Topics include reflecting on your unique journey through life transitions; creating meaning through reflection on self-made images and how one’s inner experience might connect to one’s outer experience. This presentation is for the ADEC 39th Annual Conference in Portland Or April 5–8, 2017. Jessica will present her research on Mindful Photography and its Implications in End-of-Life Caregiving: An Art-Based Phenomenology. 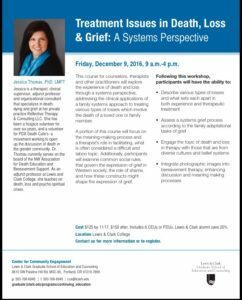 course for counselors, therapists and other practitioners will explore the experience of death and loss through a systems perspective, addressing the clinical applications of a family systems approach to treating various types of losses which involve the death of a loved one or family member. A portion of this course will focus on the meaning-making process and a therapist’s role in facilitating, what is often considered a difficult and taboo topic. 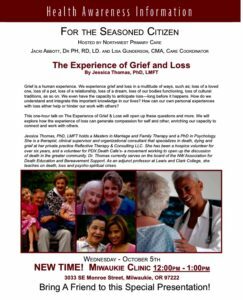 Additionally, participants will examine common social rules that govern the expression of grief in Western society, the role of shame, and how these constructs might shape the expression of grief. Addiction can surface in the experience of grief as an attempt to numb the emotional pain and suffering from the death of someone close to us. It can also be used to distract or mediate feelings of depression associated with other losses. In addition, the experience of grief and loss can accompany the surrender of addiction as one learns new ways of being and relating to self and Other. 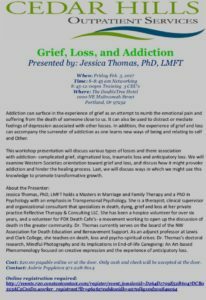 This workshop presentation will discuss various types of losses and there association with addiction- complicated grief, stigmatized loss, traumatic loss and anticipatory loss. 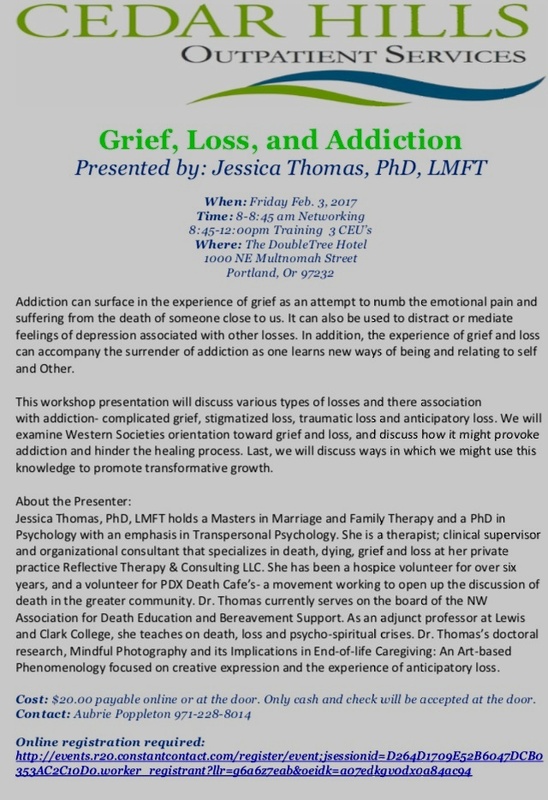 We will examine Western Societies orientation toward grief and loss, and discuss how it might provoke addiction and hinder the healing process. Last, we will discuss ways in which we might use this knowledge to promote transformative growth. At one time or another, many of us wish to talk about death. 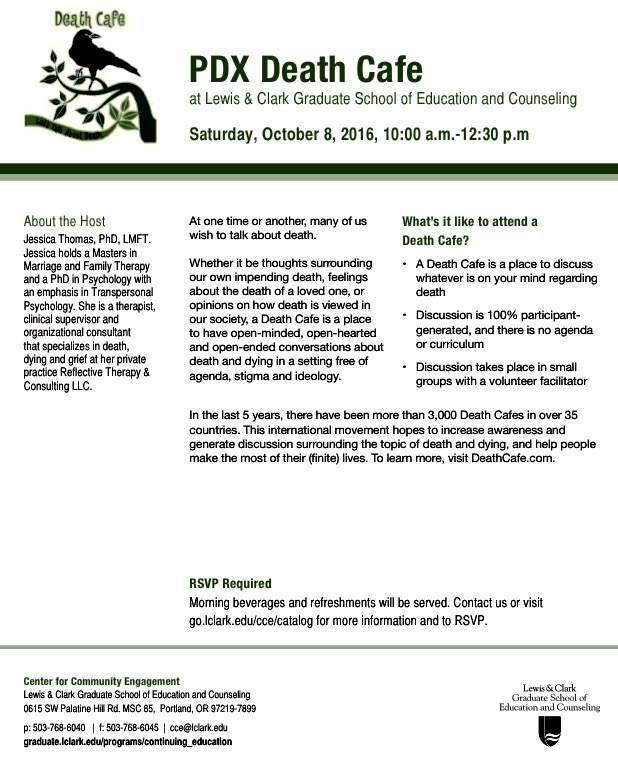 Whether it be thoughts surrounding our own impending death, feelings about the death of a loved one, or opinions on how death is viewed in our society, a Death Cafe is a place to have open-minded, open-hearted and open-ended conversations about death and dying in a setting free of agenda, stigma and ideology. 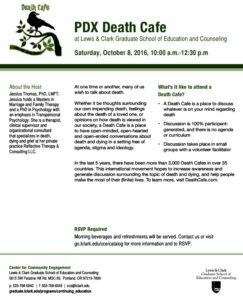 Jessica Thomas, PhD, LMFT and The Community Engagement Department will host a Death Cafe on campus. Follow the link for details and registration. Grief is a human experience. We experience grief and loss in a multitude of ways, such as; loss of a loved one, loss of a pet, loss of a relationship, loss of a dream, loss of our bodies functioning, loss of cultural traditions, as so on. We even have the capacity to anticipate loss—long before it happens. How do we understand and integrate this important knowledge in our lives? How can our own personal experiences with loss either help or hinder our work with others? This one-hour talk on The Experience of Grief & Loss will open up these questions and more. 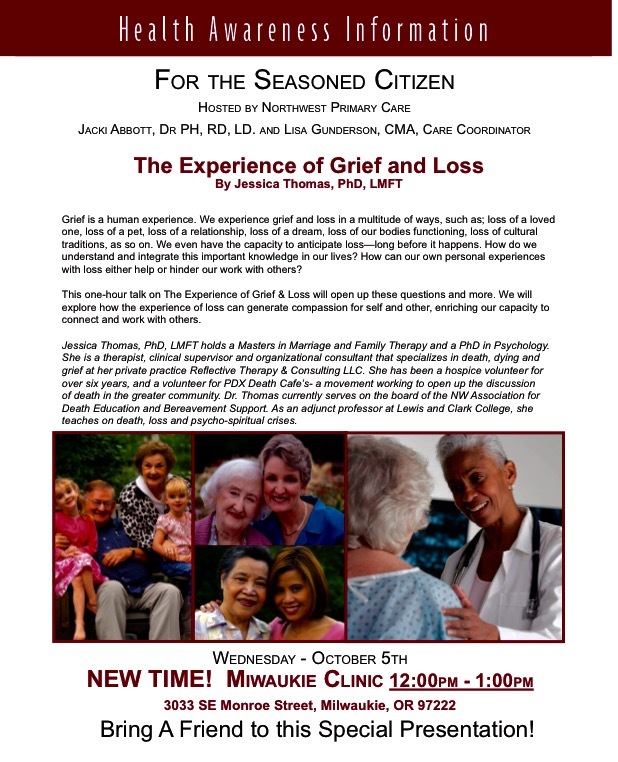 We will explore how the experience of loss can generate compassion for self and other, enriching our capacity to connect and work with others. See flier for details.